We’re knee deep into Baby Week here at Casa de Ragfield. Flanked by 2 baby showers, we’re also doing childbirth classes, a breastfeeding class, and an infant CPR class this week. Oh and for good measure, I also threw in a pre-natal appointment. Add our 8-year wedding anniversary to the mix, and all this seriously cuts into our Tour de France viewing time. Luckily Rob is recording the whole thing, but I am so far behind right now that I’m not even sure I could tell you who’s in the lead. The kick-off to baby week actually happened last Friday afternoon, when we headed back to P-town. A good friend was getting married on Saturday, and since a lot of our group would be in town for that, Amy had organized a baby shower for Sunday. A double baby shower, to be exact. Two of us from the old Dunlap crowd are expecting babies at around the same time! The wedding on Saturday was lovely, even though I observed it from beneath a thin haze of nausea. Being with my friends helped distract me from the feeling that I was going to puke, and I had a really great time. Except that I got sooooooo sick of random strangers asking me when the baby was due and inquiring about my health. When I said my due date (August 21), the universal reaction was an expression of shock and horror, with some variant of the comment, “You’re huge!” and some statement regarding their disbelief that I had so much longer left to go. I damn near punched a church-lady in the face for saying that to me. As the night wore on, I found myself answering that the baby was due in 2 weeks; gradually, I changed that to “any day now,” and then finally, I got so I just replied that my due date was “yesterday.” Seriously. My friends were all wonderful, telling me how great I looked, but somehow, all I could focus on was the dumbasses who couldn’t shut up about how big I was. I slept off my nausea and frustration and actually felt a little bit better on Sunday when it was time to head to Avanti’s (an Italian restaurant) for the shower. 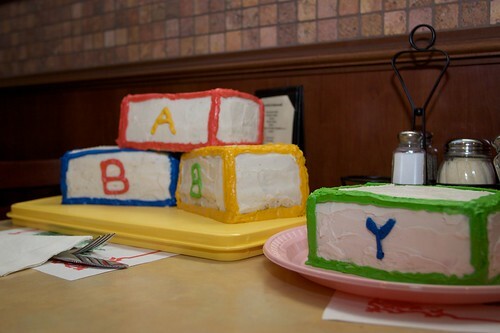 I know, I know, it makes no sense that I would have a baby shower at an Italian restaurant when my nausea makes me have a death wish against the sight, smell, or even thought of tomato sauce, garlic, onions, and melted cheese. But Avanti’s has seriously amazing bread, and they do a veggie gondola sandwich that actually has been sounding good to me for a few weeks. 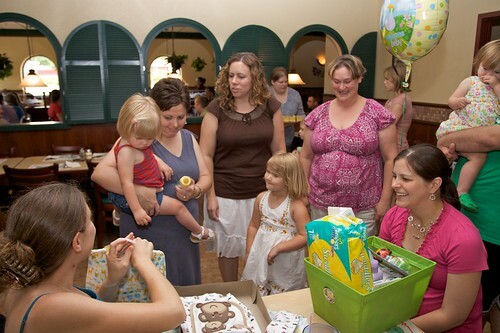 The crowd all assembled and a fantastic double-baby shower ensued! Our friends got us some really nice and thoughtful gifts, but the best part of course, was just getting to see everybody! Amy also had gotten blank birthday cards for Fig and for my friend Ashley’s baby, and then had all of our friends write messages and decorate them, so it will be sort of like a time capsule. I’m really excited about this. As long as I don’t lose the cards, Fig now already has a card to open on his/her birthday for the next 18 years! I can just picture it when Fig turns about 13. “God, mom, why did you used to call me Fig?? How lame!” Hopefully it won’t come to that. Baby cakes. Each section was a different flavor! Two cute pregnant ladies. I maintain that red shoes are an appropriate accompaniment to any outfit. 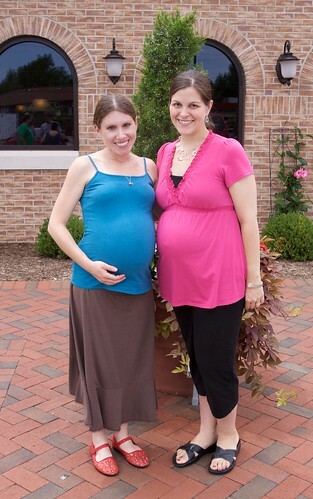 After the baby shower, we rushed back to C-U for our childbirth class that evening. I hadn’t really been sure what to expect. It’s a class through one of the hospitals in town, and I didn’t know how useful it would really be. Two of the yoga moms and one labor and delivery nurse have told me that the hospital classes don’t really prepare you for a natural, unmedicated childbirth, but my doula and midwife both said I should take it. In all honesty, I thought the class was pretty good. The instructor was kind of a hoot, but I think she acted that way to try to make people laugh and keep everyone calm so that we wouldn’t be stressed out about the process of giving birth. It was also really refreshing because this first class was all about breathing and other non-medicated ways of dealing with labor. The one useful thing I learned was that it is okay to breathe out of your mouth. A lot of books and especially in yoga class, they always tell you to breathe in through your nose and out through your mouth. This has created a lot anxiety for me, because my nose is almost always stuffed up, which makes things difficult. The instructor of this class specifically stated, if your nose is stuffy, go ahead and breathe in through your mouth, no big deal. Right then and there, I started breathing easier. It was also refreshing because a lot of what we talked about in this class was in line with Ina May’s Guide to Childbirth, which up to this point, has been my major source of information. Maybe for some of the other people in the class, it was all new information, but for me at least, it was nice to have some reinforcement for Ina May’s ideas. I think that maybe the class was even more useful for Rob than it was for me. (I’m not sure what he thinks about that). They told him stuff to do and how to do it. I really do feel that the one thing I’ve got going for me in all of this is Rob. He is like the most mellow person in the universe, and he is very good at calming me down when I am freaking out or agitated. I would never have finished the “Run for the Ranch” marathon (my 6th) in 2007 if not for him. He saw how bad I was struggling, and he ran the last 9 miles of it with me, every step of the way. Not only did he help me from getting lost (it was dark, the course markers were difficult to see, and I was stark-raving mad from dehydration and glycogen depletion), but he kept me from thinking about all the miles that still lay ahead of me and instead just focus on getting through one step at a time. I distinctly remember him telling me that I didn’t have to go fast—time didn’t matter anymore—I just had to keep putting one foot in front of the other, and eventually I would make it to the finish line. So that’s what I did. And when it was all over, he took me inside and got me a brownie. I am immensely comforted by the fact that I have Rob, but I am, of course, still freaked out by a lot of things. Mainly, I don’t really have a method. Most people who are successful at natural childbirth have done a lot of preparation—Hypnobirthing, The Bradley Method, Birthing from Within, etc. I’ve actually found out that some of these classes are available in my area, but you kind of have to go underground to find them, and at any rate, I’m way too close to my due date to start anything now. If I’d known about these options in the beginning, I probably would have done one of the classes, but unfortunately, the information was not readily available. So at this point, all I’ve got is my doula, pre-natal yoga, Rob, the hospital birth class, and Ina May’s Guide to Childbirth. Oh, and years of running marathons, plus stubbornness to the extreme (though I’m not really sure whether to count these latter two as part of my assets or not). Another major thing I’m freaked out about is the nausea. I’d kind of been thinking that, you know, the nausea would go away at some point, but by now, it’s pretty evident that it’s not. So when I go into this thing, I feel like I’m already going to start it compromised. And god forbid if Rob has eaten anything containing cheese, garlic, onions, jalepeños, pickles, or tomato sauce within a week of my labor. We did this thing in class that they called the “labor dance”—where you sort of hang on your husband and sway during a contraction (or “rush,” as Ina May calls them). It was really nice, but let’s put it this way (no offense, honey), I was only too acutely aware that Rob had eaten pizza bread at Avanti’s for lunch. At any rate, this post has gone on far too long already. Stay tuned for the continuing saga of who is going to catch this baby, when I write about the decision I made at my pre-natal appointment on Monday. Thanks for reading. 1. Glad ti enjoyed the shower, and plan to enjoy the cards for the next 18 years! 2. I had no birth method besides "I want my kid to be born" and that seemed to work just fine, so don't worry. 3. Those people at the wedding were idiots. Lest you forget, I, who have known you since you were 9 years old, didn't even think your dress was maternity wear. My name is Garrett Kiernan I was browsing internet and found your blog. The author did a great job. I will subscribe to your RSS feeds. Thank you for your contribution. I am a web designer myself. And here some examples of the websites that I designed for payday loan canada payday loans company.